Keep Warm Set, Scarf, Beanie, Gloves, Personalized w/ Custom Embroidery or Blank. Promotional, Inexpensive. Black, Navy, Red, Royal Blue, Forest Green, Charcoal or Heather Gray. Lowest price in USA, Canada. 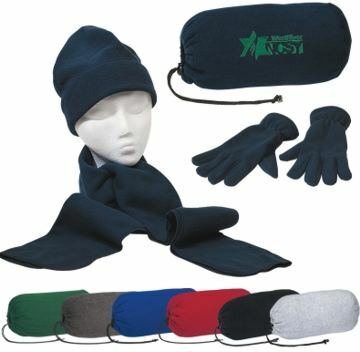 Inexpensive Keep Warm Sets with Beanie, Gloves and Scarf, in a Custom Embroidered or Blank Drawstring Bag. Optional Embroidery on the Scarf. Free Embroidery Tape for orders over 96 units and up to 7000 stitchers. Budget Prices in USA and Canada for wholesale Customized Keep Warm Sets. American clients pay no taxes.